This is a much-improved version of an existing indicator which is pretty accurate at capturing changes in the direction of the trend with a visual display on the chart together with trade signals. 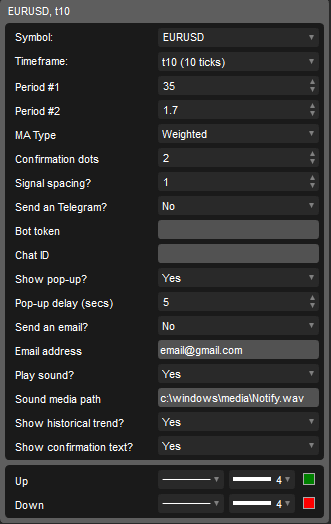 You can also set it up to receive alerts in the form of an email, instant Telegram message or audible sound. It uses a combination of 3 moving averages which filter out false signals using confirmation dots and if the symbol price is above or below the dots. You must all have heard the saying "trade with the trend" and KISS rule - "keep it simple stupid", well this indicator can assist you in identifying when a new trend starts or ends with a simple visual overlay on the chart in the form of bullish or bearish dots as well as instant alert messages. How Can I Use This for Trading? 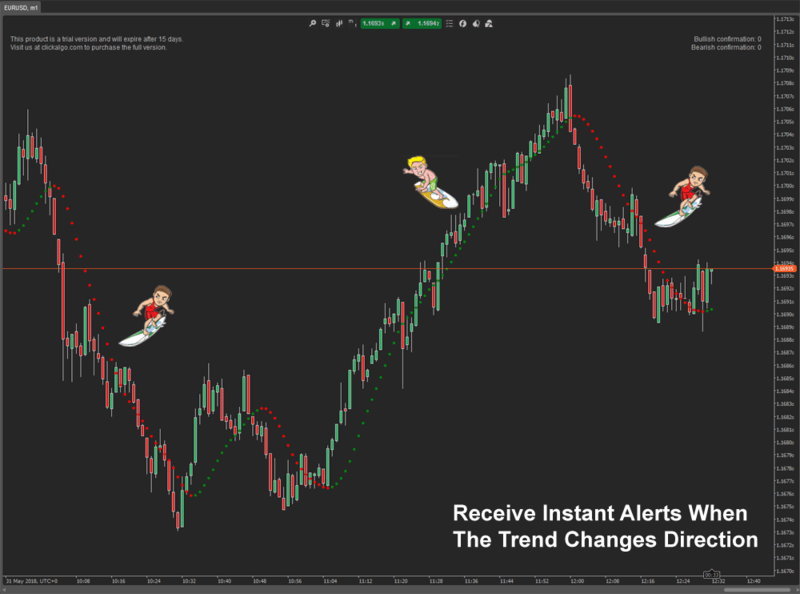 This indicator can be an addition to your other favourite indicators or used on its own to identify when a trend cycle is changing and to open a new position, an audible alert of your choice as well as a message on the screen will tell you to Buy or Sell. When the trend changes direction you will see the dots change colour, in the example above green is for a bullish trend and red for a bearish trend, the adjustable parameter called "Confirmation dots" will allow you to wait a number of same colour dots before showing a signal or sending an alert. An example would be to set it to 4 dots, so when 4 green dots are formed a solid direction reversal has taken place. Please note that the indicator will not signal a bullish trend if the price is below the dot when the candle closes and above the dot for a bearish signal. The alerts are a pop-up message on the screen, an audible sound which you can configure yourself, an email message and a free instant telegram message. Install the Telegram App on your mobile phone and receive free instant messages, you no longer need to pay using an SMS service. Your adjustable parameters are shown below with explanations of the less obvious ones.